Peter was born in Toronto but raised in Ottawa. He returned to Ottawa in 1966 after five years at the University of Toronto to establish a dental practice and raise his family with his wife whom he met at university. Since 2008, he has limited his dental practice to treating patients with sleep issues, particularly sleep apnea. He has spent much of his spare time exploring and enjoying the outdoors. He is passionate about ski touring, mountaineering, climbing, and just generally teasing gravity. Peter has traveled to many incredible locations is Switzerland, Austria, Italy, Nepal, the US and the Canadian Rockies. Peter has also explored many Canadian rivers, including the Ottawa, Gatineau, Madawaska, Rouge, Dumoine, Mountain, Skeena and Rideau, in a canoe, kayak or fishing boat. 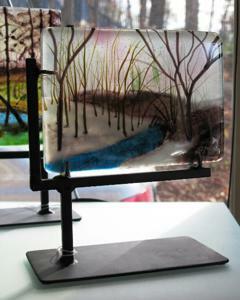 Peter's interest in fused glass was sparked in late 2007 and he continues to explore the artistic limits of his medium. 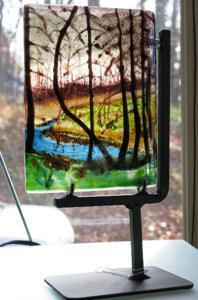 His love of outdoor pursuits is clearly the inspiration for many of his fused glass artworks. 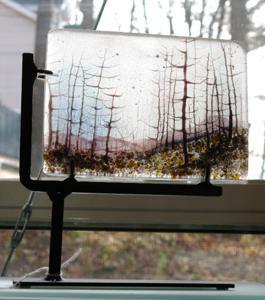 The light that passes through each plan of glass helps his pieces come alive. 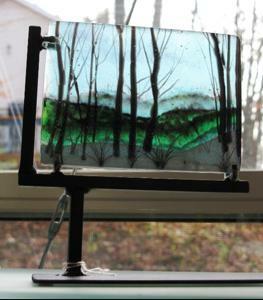 Some of his works are created with there own light source therefore allowing the piece to self-illuminate in any space.